Today's post is Yam fry or senai kizhangu or chena fry recipe. Its my family favorite recipe and makes a spicy treat as a side dish with rice dishes & curries. My mom used to prepare this atleast weekly once with minimal ingredients. In this healthy recipe, elephant yam is sliced into pieces, boiled and shallow fried along with spicy aromatic masala until crisp. 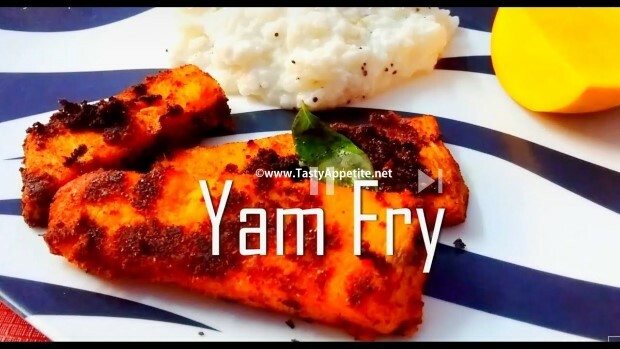 Learn how to make this simple & delicious yam fry that is perfect for any meals. Wash & soak yam in water for 10 mins to clean the mud. Take off the skin and slice to fine pieces. Take it in pressure cooker and add 1 cup of water. Drain water and set aside the yam pieces. Wash and soak a small ball of tamarind in 1/2 cup of water for 10 mins. Extract thick tamarind juice out of it & set aside. In a small mixing bowl, add turmeric pwd, red chilli pwd, coriander pwd, salt and mix. Add tamarind extract and mix it to thick paste. Take the yam pieces and coat it well with masala. Place the coated yam pieces and shallow fry till it turns golden on both sides. Also you can fry some fresh curry leaves in the same oil until crispy for garnishing. Irresistably delicious Yam fry is ready. Serve hot with any rice dishes like sambar rice, rasam rice or even it makes an excellent side dish with variety rice like lemon rice, tamarind rice, coconut rice, etc. Sigh....how I enjoyed every minute and detail of your day....so simplistic and lovely!